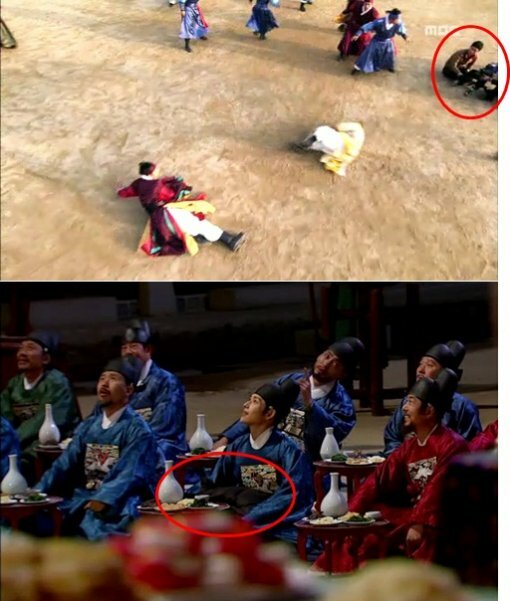 The anachronism goofs in MBC drama The Moon that Embraces the Sun were discovered. In the third episode broadcast on January 11th, 2012, crown prince Lee Hwon (Yeo Jin Goo) was playing soccer with military officers. Just as crown prince tripped to the floor, two cameramen in modern fashion and a camera were captured on screen. Another flaw is also found at the scene where Heo Yeom (Lim Siwan) is watching fireworks. In the scene, Heo Yeom was sitting on the floor between bureaucrats, and he had a black padding jacket covering his knees. The padding jacket was non-existent in the Joseon Dynasty where everyone wore hanbok. Netizens commented, “It’s understandable,” “The goof is also interesting,” “Totally immersed in the drama, don’t even notice it,” and so on. The Moon that Embraces the Sun rated 23.2% for national average ratings, and still maintain the rising trend.